Computer Networking Wireless Access - Advance Communications & Consulting, Inc.
Wi-Fi technology has improved greatly in recent years, but it’s not a one-size-fits-all, especially when it comes to businesses. Many large office spaces with heavy traffic typically utilize indoor wireless access points and/or outdoor wireless point-to-point airFiber®, while small offices with limited users are more likely to have wireless routers and range extenders. An access point is a device that creates a wireless local area network (WLAN) in an office or large building. It connects to a wired router, switch, or hub via an Ethernet cable, and activates a Wi-Fi signal to a designated area. For example, if you want to enable Wi-Fi access in a specific area, you can extend and connect a cable to that location with access points. By installing access points throughout the office, users can roam freely from room to room, seamlessly and without experiencing network interruptions. 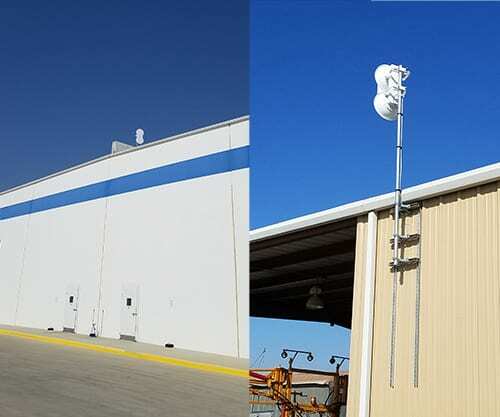 An airFiber® outdoor point-to-point wireless network is a device that bridges or links two endpoints exclusively together through line of sight (LOS). Typically, these devices are used when fiber cabling is impossible or inconvenient in connecting two points that are separated by a street or distance. The networks at either end take full responsibility for formatting the data transmitted between them. Let us help you with your indoor and outdoor wireless needs. With our technical expertise and project management style, we offer customers the peace of mind that their most critical communications systems are in the hands of proven and professionally trained technicians.